New York prison break manhunt: Convicts still not located. 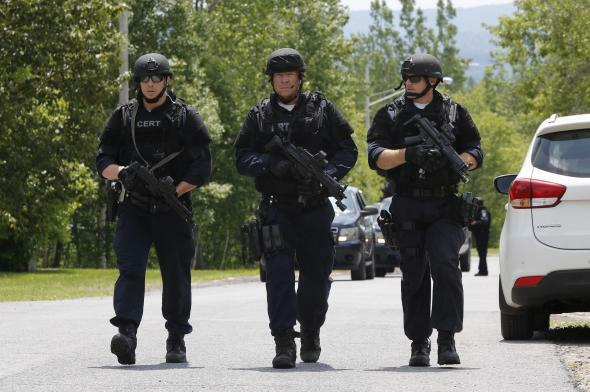 Law enforcement officers near the Clinton Correctional Facility in Dannemora, New York on Wednesday. June 10, 2015. Despite a focused, daylong Tuesday search in the area of a potential sighting, authorities still haven’t located the convicted murderers who escaped from an upstate New York maximum-security prison—who have now been on the run for more than 100 hours since their cells were discovered empty at 5:30 a.m. Saturday. For an superb and profanity-heavy summary of the entire saga, you can read this Gawker piece, but here’s the gist: Two prisoners, one serving a life sentence and the other serving 25 to life, cut through their cell walls and wound through a series of vents, catwalks, and pipes before emerging from a sewer outside the Clinton Correctional Facility. (An accomplice of one of the escapees—Richard Matt, who was convicted of kidnapping and killing a businessman named William Rickerson in 1997—described Matt as “very cunning and dangerous.”) A woman who worked at the prison and may have been having an affair with one of the escapees (Matt, who is “well-endowed“) was allegedly supposed to pick them up in her car, but checked herself into a hospital instead, possibly citing panic attacks.